You can easily find different arbor presses that range in size from small table mounts of about five pounds to large presses which almost exceed 500 pounds. Typically, smaller ones are used by jewelers for inserting precious metals into small tubes or orifices, while large presses are used for pushing bearings into precision machinery. Regardless of the sizes, all of them have a rack gear that’s attached to a long handle. The handle of this press moves the gear up and down. This simple machine is contained or held into place by a frame casting. The casting frames can be mounted to a workbench, and they usually have a specially designed metal frame made for a stand-alone station. The rack gear is typically square in shape, and the end of it is one that pushes a part into place. The larger part is placed on a lower press plate that normally rest on the lower half of the casting frame. Typically, the plate can be easily moveable. You will also find this plate to have a series of slots which is already built into it to allow a pushpin to fall through directly to the pressed part. Make sure that you place even a small part on the moveable press plate of the arbor press. You can use a bearing assembly in which the old bearing must be removed and replaced with a new one before you insert it on the press. Don’t forget to turn the part over so the bearing is set up in its upside down position securely on the arbor plate. It is important as well that you align the bearing with the large hole at the bottom of the arbor press you are going to use. The bearing will easily fall out with this position. The second thing you need to do is to insert the pushpin into the rear of the bearing assembly to make sure that it will securely set against the backside of the bearing. You should also lower the square rack gear so it can touch the end of the pushpin. Now slowly pull the handle of the arbor press downward. Don’t forget to push the bearing from the assembly you set up. The bearing will surely fall out when you will apply enough pressure and force to the handle. Always return the handle of the press upwards to its first ready position. Now that you have learned some of the basic things about arbor presses, make sure to apply these tips when using this machinery to help you get the best results. This entry was posted in Arbor Press on August 16, 2010 by FindItOnline. Looking for small arbor presses that can help you finish up a job as thoroughly as possible? Then you won’t have to look that far. The first thing that one needs to consider when looking into buying an arbor press is to know exactly the type of arbor press that you would need for your work. If you have to deal with intricate and fine detailed works, then you are surely in need of a small arbor press. An arbor press is a mechanical advantage press. Designed for detailed works, it is aptly made from high strength steel and is built in a frame. This machine is typically called an unpowered tool since the operator uses his own strength to turn the gear of the press, and the press compounds the operator’s strength. Its similarity to heavy duty press machines is undeniable; an arbor press is usually rated according to the load it can exert into an object. As there are a great many varieties and sizes available for an arbor press, one needs to choose well. For detailed or precise works, it is highly recommended to use a small arbor press. It is typically designed to apply force and not impulse to achieve press fits. 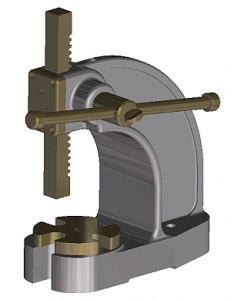 A small arbor press is ideal to utilize when working with complex and minute-detailed works. It’s considered a standard tool used when it comes to insertion of precious metals into tube by jewelers. But aside from this, a small arbor press does have a lot of other purpose. And it’s totally convenient to use, definitely not cumbersome or bulky. It can easily be mounted on a working table and is certainly suitable to use even at a machine shop or even at home, when a handy man works with the badly needed home repairs. In selecting a small arbor press, one more thing to keep in mind is to go for for a brand that is of good quality and at an extremely affordable price. Surely there are excellent companies that offer a small arbor press that are built to very high standards, thus it results to years of profitable service; some would even last for decades, which is good since the product is worth every cent that you had spent for it. Small arbor presses are made of heavy ductile iron casting that offers incredible strength and rigidity. All frames are cast of heavy, reinforced steel and incorporate a flanged splint design that adds strength to the press body. The base of a small arbor press are machined for maximum stability and drilled to permit bench or pedestal mounting. Also, precision ground rams use a unique square design to provide larger bearing surface and ensure longer life than round rams. A small arbor press is surely needed to get things done. Given that it is used for light press work, it really is handy when dealing with precise works. It can be utilized for light bending as well, and in this regard, a dial indicator can be used to make repeat precision bends. Whatever purpose you might need it, having a small arbor press would really make your work easier. This entry was posted in Arbor Press on July 19, 2010 by FindItOnline. Palmgren arbor pressess reached their eminence when dedicated patrons became exultant after its release. It was in the year 1919 when Clarence Palmgren established the Palmgren Corporation. From the time forward Palmgren Corporation has come to be the leading light in the metalworking market. The initiator Clarence Palmgren is a graduate of Illinois Institute of Technology. He created projects and manufactured machine and rotating table that provided stimulus to the metalworking industry. Up until now, Palmgren is the market share frontrunner and identical with Drill Press vises and work-holding. Palmgren arbor press units are mostly built in the United States thus it offers excellent worth and features. This machine is very helpful to numerous machine shops. Palmgren arbor press is used in detailed process of small presses. It is as well used in widespread joint replacement, pressing wheel bearings into axle covering and putting in into a drive shaft. Machinery jobs like the above mentioned work should be run by a trained arbor press operator. Often times, these operators prefers a greatly advanced quality machine thus they undoubtedly choose Palmgren arbor press. It is undeniably a worthy product since countless devoted client hang onto on ordering Palmgren products and designs. Palmgren arbor press in fact has several diverse models to pick from. Altered machine required jobs have proper Palmgren products suited for every chore. It can be putting in a tiny diamond in a ring or any type of jewelry or to put in wrist pins into piston rods. It is very critical to align or do small stuffs; as a consequence it needs a good quality machine such as Palmgren arbor press. If in the future you can browse to Palmgren associated websites selling some of their other Palmgren products, you will be able to see the comments of the customer. From this kind of information you will be able to weight the advantages and disadvantages of what are you going to buy. Just to share to you a satisfied customer experience. Let me just tell you what the customer have said about the Palmgren arbor press. He actually detailed that when the Palmgren arbor press was transported it is well packed and came on time. The machine is substantial and solidly built. On this part, he must be denoting to a different model of the arbor press. The customer also added that it is smooth in action. Of course he should say that it comes slathered in lubricant and you as a buyer have a necessity to wipe it off but in his case left a thin coating to avoid the machine from tarnishing. Just to cut the customers story small, he was glad of the uses of his new Palmgren arbor press. The set has satisfactory directions thus it assisted him a lot. The customer essentially purchased it for a specific purpose but after certain testing done he found out that he can sort out more jobs with his Palmgren arbor press. Well, this is a story that rationalizes why since 1919 Palmgren products has been the prime leader in metalworking industry. So if you’re thinking what to buy? Better choose Palmgren arbor press. It is so multipurpose that you will be astonished of its usages. A used arbor press is the answer to people who desires to save penny but still can buy a good quality machine. If you are a handy man and wishes to save lots of hours of whipping and thrashing then the answer to your burden is the arbor press. This machine is so versatile that you can use it in whatever job that needs the above mentioned action. Thus arbor press is wildly used in machine shops. In websites that sells this kind of stuffs like the www.ebay.com, used arbor press can be purchase in a lesser price than the new machines. It is a lot inexpensive but nevertheless still in a good condition. These used arbor press items that are for sale can still preform the same function of an arbor press. It can also put in pistons and wrist pins into piston poles. As well as, it can do detailed operation on small presses jobs. It archetypally utilizes a hand operated hydraulic ram astride inside a steel frame. All in all used arbor press is still the same as the new machine. It just the fact the seller might need the money to buy another tool. He got no choice but to sell his used arbor press. In our condition these days that everything we need seem like increasing it might not be a ruthless idea to bargain used stuff. Just like for tools like the arbor press. If you get a chance to be acquainted with somebody who is marketing his used arbor press, then why not grasp that chance to bargain it for yourself. It is for sure, that obtaining this kind of tool is not a waist of cash. You can even gain enough by saving a lot of energy in hard jobs. Used arbor presses are also available online; aside from www.ebay.com that I first mentioned there are also other sites that provides information on how to acquire used arbor press. It is essentially necessary to have this kind of machine even in your own home or machine shop for the reason that frequently a piece refuses to come loose when pressure is applied. So in these cases it is regularly the practice to rub in the extreme amount of pressure to a piece and let it to sit under pressure for a little while. The pressure frequently gets the better of the stubborn part and it will pop at liberty. It is rarely required to put on heat to an object in a press, but when heat is compulsory to release an item, use it economically. The reason why force is being sited on the object along with the applied heat could source the part to come shooting out of its mounting location and can result to wound or destruction on the work place. Thus the role of arbor press should take place to have more security. Buying used arbor press is economically friendly but a reminder to keep, always double check what needs to be check. It is okay to save you need to make sure that you are purchasing a quality product in a low-priced value. It is always advisable not to use a drill press as an arbor press since the drill press could be broken or damaged. Drill presses are great for pressing drill holes against a metal surface, but not a real press which is capable of handling tons of pressure from the machine. When you talk about the drill press, people think that what you are saying is about arbor press. It is important that you expand your thinking and search for broader details and information about it. You probably need a press which can help you solve your problem. Unfortunately an arbor press might not be your best choice. There is no such thing as a press that was too big or had too much power. Yes, you may have a particular plan or project in mind, which may suggest that you will need a small press in order to make your plan successful. For the first use, you might get by and achieve the results you want. But new press owners find such presses too versatile and useful to be assigned to only one job. That is why it is advisable to use this press for several tasks. An arbor press is actually a bench press model and as a general rule, bench models of any machine tend to have limited usage. That is why it is always wise to go directly with the upright floor model shop press. The floor models take similar amounts of space in the shop no matter the how big or small the capacity is. This press is powerful and very useful when finishing such tasks. An ‘A frame press’ vs. ‘H frame press’ – an “H” press may have a somewhat larger and bigger task and work volume, but not as steady like other presses. Other than that, there’s not much difference between the two presses. The two most important tools that provide quality and trademark impressions are a hammer and a steel punch. Both of these tools have the standard method to apply such qualities. However, the results are more often than not complete and limited, sometimes even very difficult to read and poorly aligned. By taking advantage of the leverage that the arbor press provides, you can get deep in your tasks. Results are consistent and will surely provide you readable impressions. If you are looking for a high quality mark or maker mark to a piece, the tool you need can be actually driven by the arbor punch. To make sure that you don’t punch too deep on the surface of your materials, a piece of metal with smooth, flat ends should be placed between the work piece and the ram to control the it. Make sure to keep the ‘spacer’ with the arbor punch so it can be used every time you need to use the punch. This entry was posted in Arbor Press on July 16, 2010 by FindItOnline. Have you heard about the 1 ton arbor press? If so, have you heard about the warnings and precautions you should consider about this particular arbor press? If you haven’t heard about it then this article will surely be very useful since it will tackle it. Here are the warnings and precautions you should consider when handling 1 ton arbor press machine to ensure your safety as well as the safety of other people especially if you have small kids in your place. It is always advisable to keep all the stuff you used after you worked to prevent more problems especially fi your kids freely move in and out in your working area. Bear in mind that those clutters can actually invite more injuries and harm in the future. If you think that your working area is no longer appropriate then you’d better see and check which areas are in need of fixing and material replacing. It is advisable to check your working area whether it is still has the right shade against rain and direct sunlight since 1 ton arbor press should not be placed against direct heat and or in a place where it can easily get wet or damp by the sudden changes of the weather. Just like any other machines and tools, it is important that you keep your stuff after you used it. Make sure that you keep them or stored them in the right place wherein no kids can reach it. Bear in mind that this tool can cause problems if you are going to leave it just sitting on your working table. If you will get the 1 ton arbor press to help you with your tasks then you’d better learn how to handle and use it properly so as to avoid problems. Make sure that to use or even force the tool especially if this tool is not intended for the tasks you want it to perform. Doing so will only cause more problems and sometimes once the damage is done, you will find it very hard to fix it. One of the most important thing you should never forget to do is to make use of any protecting gear for your eyes and hands when using such arbor press. If there are any chemicals involve on your tasks, make sure that you sue a special kind of gear that will help protect you against those harmful chemicals that might get in your eyes and skin. These warnings and precautions should be always followed especially if you are a new user of 1 ton arbor press. Bear in mind that prevention is better than cure. To get the best results of this tool, make sure to get more details and reviews about it in the net. Have you heard about the dake arbor press? Are you interested to know more about it? If so then this article will surely help you get all the details you need. Dake is know for its high quality tools such as arbors and also offers a complete and inclusive line of hydraulic presses such as arbor presses, bench presses, tire presses, laboratory presses, drill presses, belt grinders, power hammer, horizontal band saws, vertical band saws, mitering band saws, cold saws, tube benders and tube notchers which are all known for its top notch performances. Dake Arbor press offers three different kinds of presses which you can choose from according to its usage and of course according to how you are going to use it and where. The first kind of dake arbor press is the arbor press single leverage. These Single Leverage Arbor Presses has a special feature such as shimmed ram cap, adjustable handle, and smooth action gears which are all made from high quality materials. These single leverage arbor presses also have a simple base opening and slotted table plates, pedestals, and table plates. But some of these features are only available in different models. Some may or may not have these features. Other special features of this type of arbor press are the shimmed ram cap which allows take-up for more potential usage and wear, it also has a smooth control action gears which allows the user to get maximum results of the tool and its pedestals are available in Y, 0 and 1 model. It also has a very easy to handle adjustable handle which allows the user for more convenient position usage, has a base opening for more arbor tasks and even has a table plate for easier usage. The second kind of dake arbor press is the ratchet lever. This second kind of arbor press features a special device which allows the user to use the lever in a very easy and convenient way, its counterweights also allows the lever to be handled easily and to put down more easily after usage, its hand wheel allow the ram to work the lever more quickly and easily and it also comes in different pedestal models such as 1 – ½, 1- 1/2B and 3A. The last kind of dake arbor press is the compound leverage. This arbor press actually steps up the pressure of the arbor for heavier press work and tasks. These Arbor Presses that come with a compound leverage mechanism features a special kind of sliding pin, rack and even a pinion table adjustment and readily available pedestals for bench models. It comes in model 5 which has a dual swinging table. If you want to make your presses tasks a lot easier and get the best results, then you need to get one of these dake arbor presses. It will not only give you the results you want but could also make the tasks a lot easier to get done. Have you heard about the hydraulic arbor press? There are actually many manufacturers of this press and one of the most trusted makers is the Baileigh. In this article you will get to find and get all the details and information you want about this particular arbor press. Baileigh is one of the most popular makers of such arbor presses and they also offers and provide their customers great H frame hydraulic arbor press and arbor press line that is known for its very high standards and top notch materials that offer years of profitable service and high quality tools for decades to come any machine or fabrication facility. They offer and provide their valued clients five different models of hydraulic arbor presses to meet most common usages and tasks. This maker also offer the two most popular tonnages of arbor press such as the single leverage or ratchet-type single leverage actions which is known for its useful application . Their hydraulic arbor press line is popular and usually consists of a different ton manual hydraulic press which you can choose from 66, 110, and 176 ton hydraulically powered H frame press which are both very in demand for its high quality performances. Each arbor press is heavily built using material that is heavy steel plate and is also electro welded together for more durability. For more serious tasks, it is advisable to buy the industrial type and since machine shop owner who expects only the best quality from their hydraulic arbor press then this one is their best deal. This particular arbor press comes with a high and low speed as well as a manual pump for easier performance and use for fine adjustments or insertions of the material. On the 66 ton or larger hydraulic arbor press the entire industrial grade hydraulic system can be move easily from left or right since it rides on durable ball bearings. The bottom beam has an attached chain to cylinder which can easily be the lift system which is use to drop from one corner or area to another with as standard usage. Extra wide beams are also being offered in different models of hydraulic arbor presses. This arbor press has also an H frame hydraulic line which has vee block supports as an option in case you need it for your tasks. A Baileigh hydraulic arbor press is made of a heavy and durable ductile iron casting that offers incredible strength and rigidity to the overall framework of arbor press whichever styles or designs you choose. The base, ram housing, framework and 4 position bottom plate are all machined made with top notch performance for more accuracy and trueness of the usage of the tool. They also offer a 3 ton hydraulic arbor press that comes with a ratchet-type single leverage action handle which creates maximum pressure with each pull and press of handle for more maximum results. For an advance flywheel it is also a ram return and that comes in this arbor press for positioning and repositioning the materials used for speed and high quality finish of the tools’ performance. If you have some assembly work to be done, you can make the job easier by using an arbor press. It has impressive effects and speeds up the work to be done. An arbor press is a workshop tool that is used to press two things together. This looks like a small hand operated press. This is very useful and is used to do smaller jobs like riveting, installing, press fit work and removing bearings. Arbor presses are classified according to the maximum load or force they can apply to the things that need to be pressed together. There is a one ton arbor press, a 3 ton arbor press and a four ton arbor press. The 3 ton arbor press is a hand operated press that is applicable for an object or objects that need to be pressed together and could exert an effort of three tons. The 3 ton arbor press is very safe and easy to use. This ‘ton’ specification actually refers to the amount of effort that could be exerted by the press itself. The 3 ton arbor press looks like a mounting press. The 3 ton arbor press has a maximum height of five and a half inches with a maximum diameter of eight inches. Its leverage ratio is twenty is to one and its largest arbor is one and one-eight inches. The base dimension of the 3 ton arbor press is five inches by eleven inches. The 3 ton arbor press is an all metal hand operated press. It also has a slotted table. It isn’t so heavy so it easy to transport from one work bench to another. The 3 ton arbor press is used if you have some mechanical work to be done. It makes stamping and pressing steel and metal together very easy. This 3 ton arbor press is also used to install or remove bearings. There are arbor press plates required to make the job easy. The job of pressing is first done by mounting the machine on the workbench. You then prepare the objects that needs pressing. For instances that you would want to remove the bearings, the method done is practically the same. Any wood or metal material could be pressed by the 3 ton arbor press just as long as this isn’t too big and would only require a three ton force. There are also mounting holes included for easier pressing, removal and installation purposes. You could then proceed with the pressing. But just in case the object is too thin and too low to be pressed, you can use a series of plates or blocks to set a platform for the bottom of the arbor press and place the objects that needs pressing on top of these plates. You will be really impressed at the result of the finished work you have. It is therefore a must-have to own an arbor press on every home’s workbench. Keep in mind though that these are classified in different tons. So it is not enough that you only have one arbor press.